~Mrs. Mathis' Homeroom~: Lending Protractors and Rulers to Students...How to Get Them Back! Lending Protractors and Rulers to Students...How to Get Them Back! Every teacher knows this. When you lend a ruler to a student (or ANYTHING for that matter), you don't always get them back. Out of 29 kids in my room last year, I'd say a third didn't have rulers or protractors to work with during math class, even though I gave them each one at the beginning of the year. Seriously. What do they do with these things? How is it that I hand out 29 rulers and protractors and I still have to lend out 10-12 each math lesson? Yet, when I get them to clean their desks out, NOBODY has any of MY STUFF! I was getting incredibly frustrated. Then I remembered this trick that a colleague showed me a few years back. She taught in Grade 8. 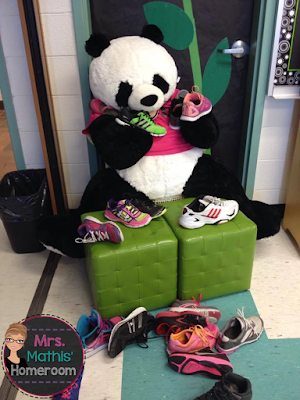 Whenever she would hand out a protractor to a student, they would give her one of their shoes. She stored them under her desk. When they returned the protractor, they got their shoe back. GENIUS! I tried it with my 9 and 10 year olds this year and it worked like magic! No more lost (or stolen) rulers and protractors! And Manda Panda loves guarding the shoes while the kids work. I only had one little girl who was concerned about the fact that she was taking off her shoe. She was worried about having a fire drill and not wearing both her shoes. I simply told her that she could avoid this all together by having her own supplies and taking care of them! Problem solved! Do you have a fun way of keeping track of your class supplies?